What is the Google “Medic” Update? Why did websites drop in rankings? In August 2018 Google released an update that was quickly dubbed as the Google “Medic” update due to the large amount of websites in the medical industry that were affected. Although not every website affected by this update was related to the medical industry most of the sites affected were medical sites. What this update did exactly is still up in the air, but in this post we are going to go over the steps we took to help one of our clients make a full recovery. The survey conducted included over 300+ websites and aimed to get a better idea of the kind of websites that were targeted by the update. 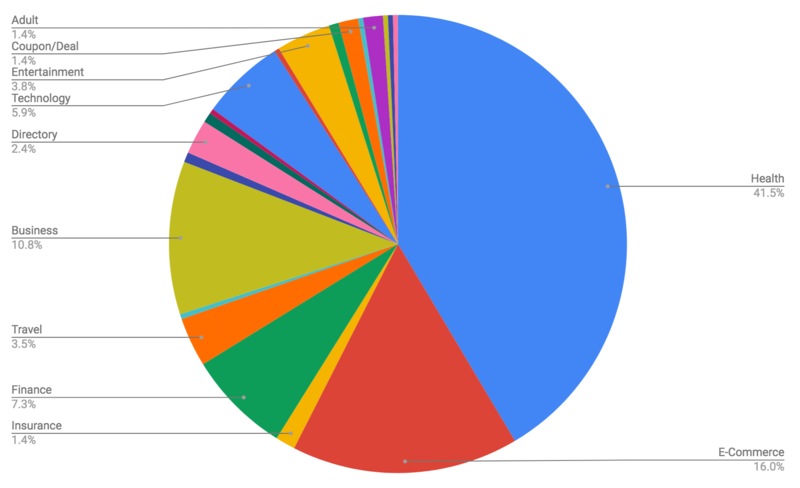 As you can see almost half (41.5%) of the websites affected were in the Health industry. Learn more about the survey at SEO Round Table. As stated previously exactly what the Google Medic Update affected is unknown. Although there have been some theories for us to go off of. Many claim that the Google Medic Update targeted authority and trustworthiness, an important factor for the health industry. When our team first analyzed the situation we decided to focus on building up the trust and authority of websites that were affected. Below you can see the large drop the site we were focusing on saw in August. Although the update officially happened in the first week of August it took a few more days for the site to really see the full affect of it. Our client immediately felt the impact on business from dropping in rankings, eager to get back to the top of Google we went after a multi-pronged approach. Although it’s hard to say which part of our approach had the biggest impact on our clients recovery we will detail all the changes we made below. As mentioned above our priority was to increase Google’s trust in our client’s website again. The website we were working on already had some schema markup present but it was not very detailed. We updated it to include additional information. Additionally we added schema to the about page, including person schema highlighting important health professionals. Our team found a few prominent health blogs in a similar space to post on. Our high quality posts were incredibly relevant to the client and their work. Providing Google with additional references to our clients website as well as the kind of work that they do. We had our professional writers work with the client to come up with additional content for their site. We added thousands of words in content over a period of 3 months. This content was spread out throughout the site including on the homepage as well as many additional new pages we created targeting specific keywords that we had lost traction for. The content went into more depth on the kind of services our client provided and their experience working with these services. In addition we posted a few blog posts. Before this update our client was using a host they had found themselves. We moved them to our ultra fast hosting, boosting the websites load time. Additionally we set them up on Cloudflare to ensure no matter where people connected from they were able to see the site as soon as possible. We conducted a few visual upgrades to the site to improve usability and provide users with a better overall browsing experience. These updates were conducted on the homepage as well as on all the new pages that were created. Over the next few months we will be updating the rest of the pages on the site. Although it is impossible to say which updates of ours had the biggest impact and how much our updates had to do with the medic update the results speak for themselves. Our client saw a huge boost in ranking over the next three months as we continually updated their site. They are now ranking even better than before the medic update and continue to climb up the rankings. As previously mentioned it’s hard to say which areas were most affected by the Medic Update and which of our updates had the biggest impact in helping our client recover but at the end of the day we are thrilled to have been able to help them make a full recovery and hope that they will continue to increase in ranking over the next few months.